I reserved this book from the library with plans to leave it on the coffee table over Christmas for everyone to dip into and enjoy; it's just that type of book. Sadly I didn't get it in time, but I enjoyed it just the same. 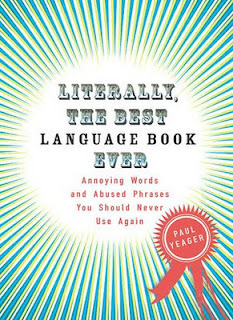 Yeager has divided his book into chapters, some of which include: Illogical Words and Phrases, Excessively Trendy Words and Expressions, Inarticulate Language and more. I was shocked to find that I was guilty of committing one of his offences in the very first chapter, Grammar Errors. I didn't know this, but firstly, secondly and lastly is poor grammar, as first, second, and last are already adverbs and therefore don't need the additional -ly added. I've always done this, and I'll probably forget this rule and do it again. And this was only on page 3! However; after this chapter I laughed at the cliches and phrases, buzz words and double speak that irritate the author, and found myself wanting to read out every second entry to whoever was near. At the end the author also included the phrases that annoy and irritate his wife which was amusing. Literally the Best Language Book Ever - Annoying Words and Abused Phrases You Should Never Use Again is a great book to share with others, with short sharp entries, a sense of humour and a light approach. I'll have to see if my library has a copy.